First Impression | This foundation gives me a light to medium coverage with a slight glow to my skin. I wore it for 13 hours (9am-10pm). I didn't set it with powder (only set under eyes, forehead, chin) and only started to get oily until around 7pm. As for packaging, cute but could get messy like the Cover FX Custom Drops. Did not notice if there was a smell or not. Review | Good foundation. I feel like this one is better applied with a brush. With a beauty blender, it gives a light coverage. With the brush, I'd say I got a medium coverage. It doesn't make me look overly dewy to the point that I look oily. It gives a nice glow to the skin. I recommend this foundation to people with normal to dry skin types. First Impression | Really strong scent for men (but I don't mind). Very runny, but after rubbing into the skin got tacky. It allowed my foundation to go on smoothly and kept it on for the whole time. You get 3.3fl. Oz. for around $10. Compared to other primers that only have 1fl. Oz. Review | It fills my pores and does keep my makeup on for a long time. I did tend to get oily nearing the end of the day (though, it does not claim to keep you matte, it's not even meant to be a makeup primer lol). Not anything excessive that blotting or powder touch-ups can't fix. All in all, good primer and good price. First Impression | I applied it directly onto my face with it's applicator. It left a streak on my cheek (fixed it by applying a crapload of powder highlighter on top). On the other side of my face, I put the product on my beauty blender then dabbed it onto my face. Worked so much better and gave a nice glow. Still applied powder highlighter on top and it looked amazing. 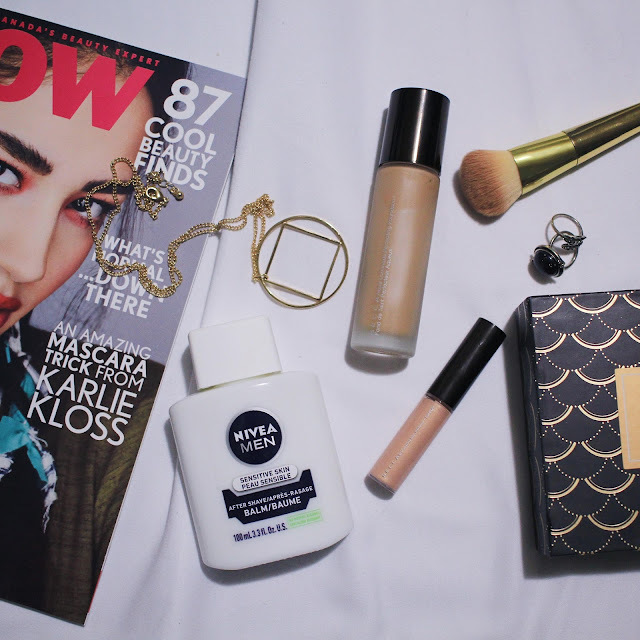 Review | Really good liquid highlighter. Just make sure not to apply it over a powder. It gives your skin a natural glow if applied alone. But if you want a really popping highlight, I applied Becca's Shimmering Skin Perfector Pressed highlighter over it and it POPS. Stay Tuned: Eyebrow tutorial (how I fill in mine).